Customizable and portable, converts any seat into an ergonomic chair. Adjustable 24" tall back supports from your shoulders to your hips with a firm foundation and visco-elastic foam. Take your office chair with you! The new Ergo Chair Makeover from McCarty's Sacroease, combines the best features from their Visco-Elastic Foam back model and their newest Ergo Cushions to make the perfect chair makeover. Unparalleled support technology combines with hi-tech visco-elastic memory foam to make these models stand out as the best of the best. The Makeover fits into most folding chairs, office chairs, car seats, couches and recliners. 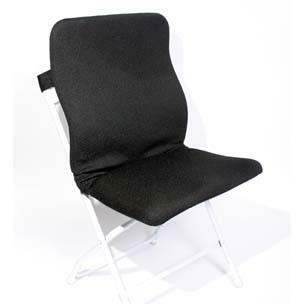 Even short back chairs can become tall backed and offer the comfort of an expensive ergonomic chair. Durable and adjustable. Doctor-recommended. Flexible backrest can be shaped to fit your individual spinal contours. 4-way adjustable lumbar support maintains the natural curve of your lower back. "S" Curve shape give giving complete back support from shoulders to the hips. Resilient latex rubber straps on a 1/8" carbon steel frame form a sturdy, breathable support for back and buttocks. 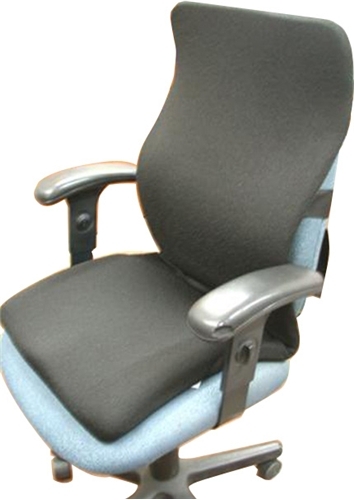 The seat is specially contoured and molded with Visco Memory Foam to optimize sitting comfort. Firm seat bottom frame prevents you from slumping down and forward into even the cushiest of sofa cushions or sagging carseats. 24" high back is designed with the same bendable steel frame, rubber webbing and Memory Foam as the Sacro-Ease Memory Foam Seat Support. Lightly padded and upholstered in soft, flexible Teknit fabric that's cool to sit on and sponges clean with soap and water. Impact-resistant metal hinges form an adjustable backrest angle and allow you to fold it flat for carrying. Depth (front to back): 17.0"
The steel frame is delivered with gentle lumbar and thoracic contours to fit an average body type. If your spinal shape is different, the frame can be bent into the shape you need. Fitting a Sacroease backrest requires some expertise in forming spinal curves into the support and is best done with the proper tools. The backrest can also be formed by a stong person over the knee, but if improperly done the unit can break - in which case it's not covered by warranty - so be careful! Many Sacroease dealers provide free custom bending services. To find a dealer near you, please contact the McCarty's Sacroease company. We closed our retail store in 2003 and no longer have the tools to provide custom Sacroease fitting services. Free shipping in the contiguous USA. Contact us for delivery to other destinations. Ships in 1 - 3 business days factory-direct from Idaho. In-stock items: Full refund of the purchase price for items returned within 30 days. Product must be in as-new, saleable condition in an original unopened package. Special order items: Final sale. No returns. We do not refund shipping charges except in case of our error or product defect. If your purchase included free shipping, actual outbound shipping costs will be deducted from your refund. See our Returns and Refunds policy for additional information.